Are you working on Enterprise level Spring MVC project? Is it with more than hundreds of classes and packages? 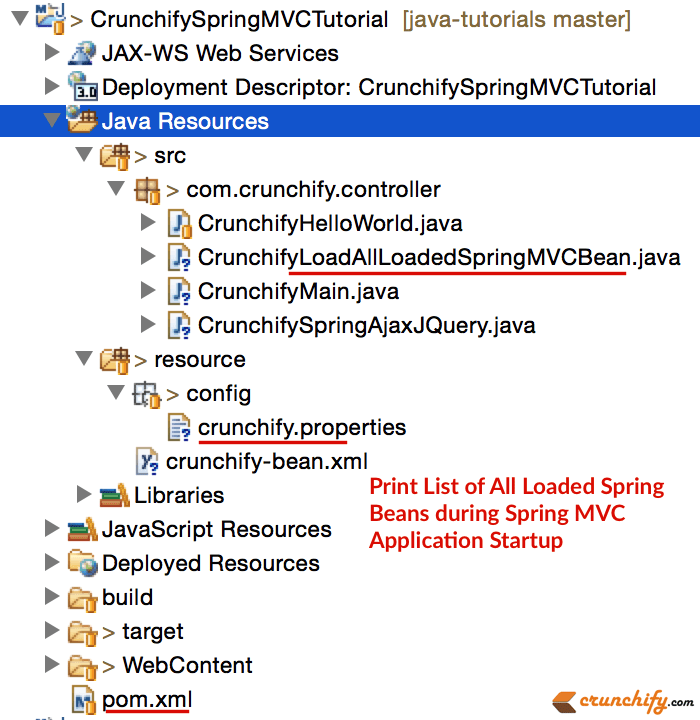 Are you really struggling on how to get list of all loaded Spring MVC beans information? Using below Java code snippet you could get list of loaded Spring Beans information at your fingertip. Pre-requisite: Follow How to use AJAX, jQuery in Spring Web MVC (.jsp) – tutorial completely. Make sure it’s working perfectly. Create resource folder as Source Folder at the same location as src folder. Create config folder as new Source Folder under resource folder. Same as above. Make sure you have below project structure. You should see result like below in your Eclipse console. There are lot more beans loaded but here I’ve showed only ~10 in above result. Let me know what you see and have any questions. a while. I made my boss very happy. Awesome dudes! Thanks for your comment. Keep visiting and happy blogging. config folder should be source folder or only new folder? I try to create the source folder but it keep create outside the resource folder. Hi Arsue – config folder is a package. Find attached diagram. I try to create the source folder for config, but i can’t create, it keep create outside the resource folder. To solve this issue, I create the config folder as new folder. When I run the crunchifyMain.java, it show below error. Is it because config folder not source folder? Hope solution in other comment should fix your problem.